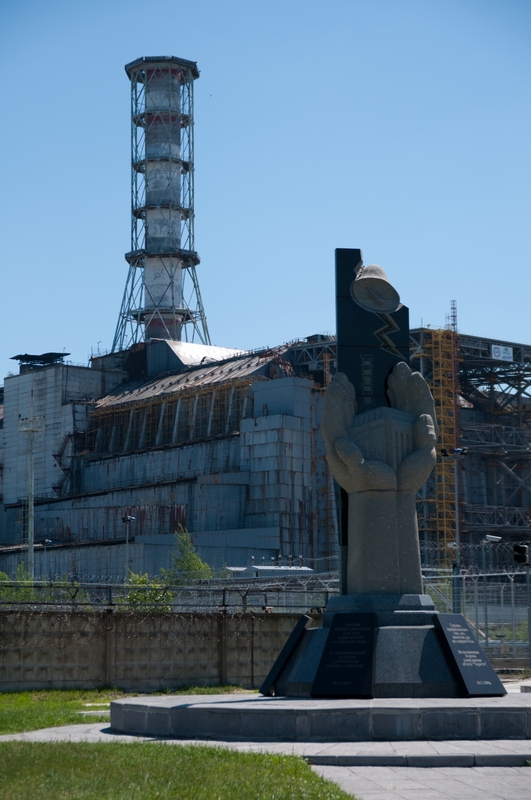 TL;DR – we went to Chernobyl, experienced the Ukraine and took some Photos. You can skip to the end to see a selection of our photos if you don’t fancy reading our rambling tale. 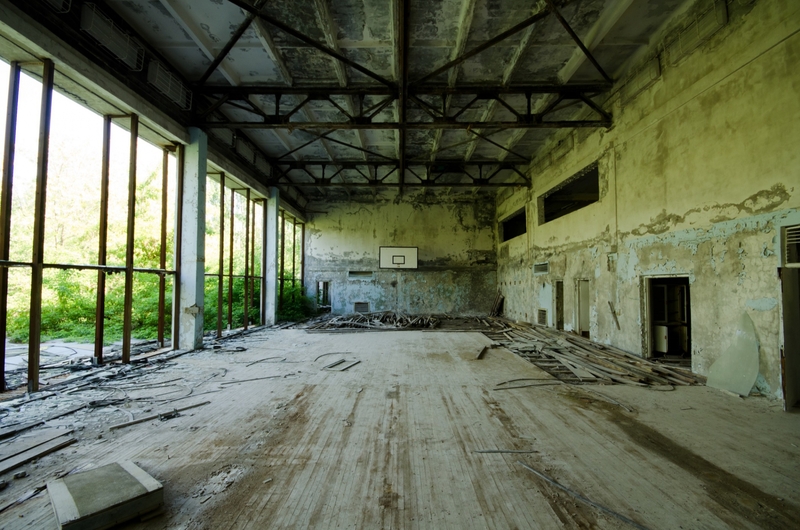 It all started whilst visiting Germany in 2010, when, standing in an underground ammunition dump vague talk of visiting Chernobyl started and our ears pricked up. 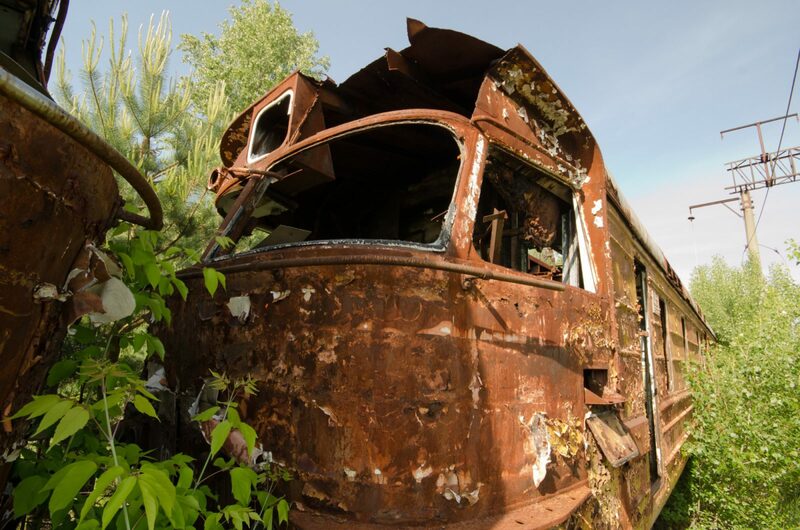 As an explorer, the Chernobyl Exclusion Zone is hard to ignore. There lays abandoned in the Ukraine the city of Pripyat which can be as your playground for a small fee, what more could you want? OK, add a train graveyard, a power station, other towns & villages, a huge military installation and the worlds second most radioactive tract of land. 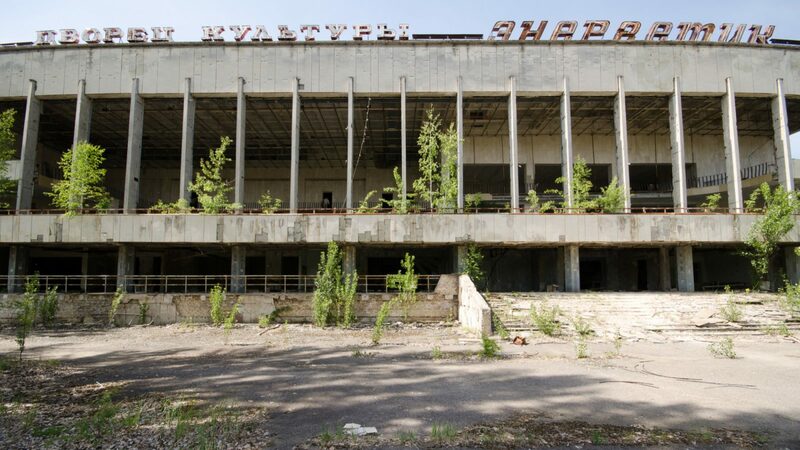 Chernobyl is somewhere that we have always wanted to explore, yet we have never been sold on the idea of flying 1,500 miles to be given a 4-Hour whirlwind tour of a few tourist spots and shooting off again. We never felt that you would see much. Our minds changed when one of our friends managed to organise for a group of us to spend 3 nights staying within the zone. The four hour whirlwind was extinguished. 2011 was a milestone birthday for one of us (30 for those that care) and rather than sit in the pub over a pint of warm bitter(ness), we boarded a Hungarian budget airline and pointed ourselves to the East. We had no idea what to expect and when we landed at Kyiv Zhuliany Airport and what we entered was utter chaos. 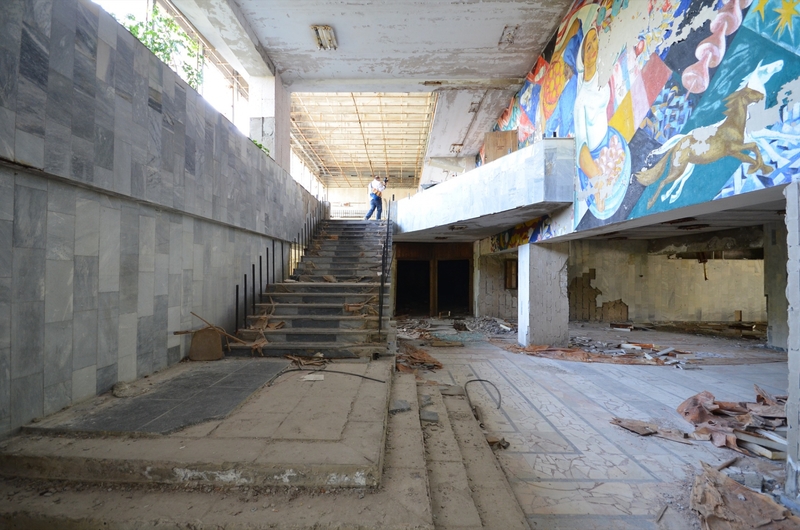 Zhuliany was an old domestic Soviet airport that had undergoing a period of rapid expansion. As is the progress typically found with infrastructure, air flights had increased dramatically but the airport lagged far behind. So far behind it had yet to really leave to drawing office. We spent an agitated few hours sweating in a marquee erected on the edge of the runway, awaiting entry into the country. It was here that we nearly didn’t even make our trip. 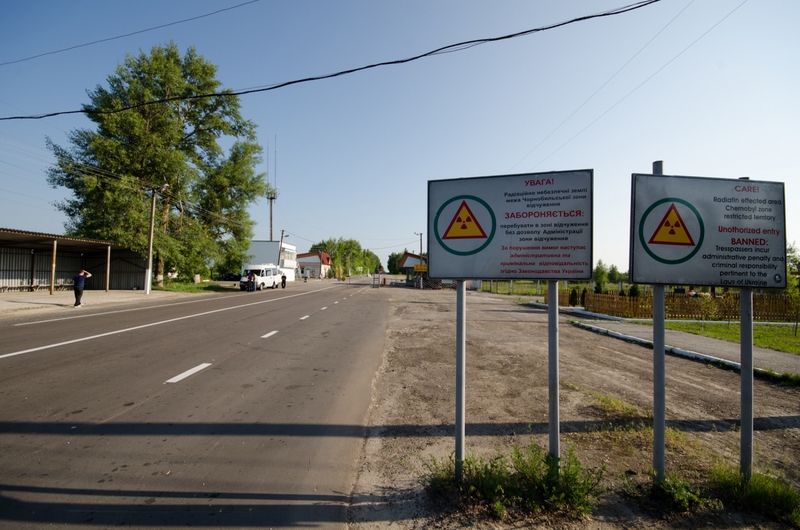 The checkpoints into the Exclusion Zone shut every night at 10pm sharp with a curfew blanketing the area. We didn’t fancy a trek through the undergrowth (others have). Having left the airport at 8:30pm we faced a two hour drive into the wilderness with a driver who was more concerned with exhibiting his knife collection than the road in front of him. After a high speed race our of Kiev, we made it just in time and feeling hungry, tired and slightly dehydrated and we slowly started to retire to bed. But first, our English fixer produced a vast quantity, and we are talking about 16 litres, of alcohol from his checked-baggage for us to indulge ourselves with. No wonder he wasn’t too happy when the baggage handling system ejected his suitcase from the plane hold at lightspeed! Our first real experience of the Ukraine, other than the shambles at the Airport, was the food. Food shows you exactly what a country is about. A few months after we visited another group took a very similar trip and dismissed the food instantly. It was good hearty food that kept us going for the majority of the day, which was an important factor as we had decided to forfeit lunch to allow more time exploring. We did make use of the local shops and smuggled snacks into the zone with us, against the advice of our guide. I liked the food, even if it was served by a stern looking women who looked as though she would not hesitate to clout you with a ladle if you made a fuss. I will happily eat a Ukranian Shepherds Pie again for breakfast. Reminiscent of the old Soviet Era and the treatment of Westerners, our time ‘living’ within the Zone was an eye opening experience. We were subjected to a curfew each night, had to travel in the company of our guide at all times and our meals were pre-planned with zero choice in the matter on when or what we had. Large military style vehicles raced along the roads and camo clothing was the fashion of the day. After an early start, and a quick breakfast in a semi abandoned building, we loaded ourselves up into the minibus and raced our way deeper into the Zone. At least we thought we were. More accurately speaking, we were driven 100m down the street to stock up in the shop where we entered the world of befuddled communication. Abacuses were used for the calculation and modern calculators used to communicate the total. We purchased the obligatory souvenir mugs and we also discovered Kvass (and if you know where to buy it in the London area, please drop us a line). Whilst wandering around outside the shop waiting for the others to finish their shopping spree, we noticed two odd things. None of the services pipes are buried, and the place is a lot busier than we expected. A few rattly coaches shot by, cyclists pedalled their way to wherever it is they are going and a handful of workers, presumably on down time, ambled past us in a cloud of tobacco smoke. Our guide explained to us that between three and four thousand people work in the zone at one time. 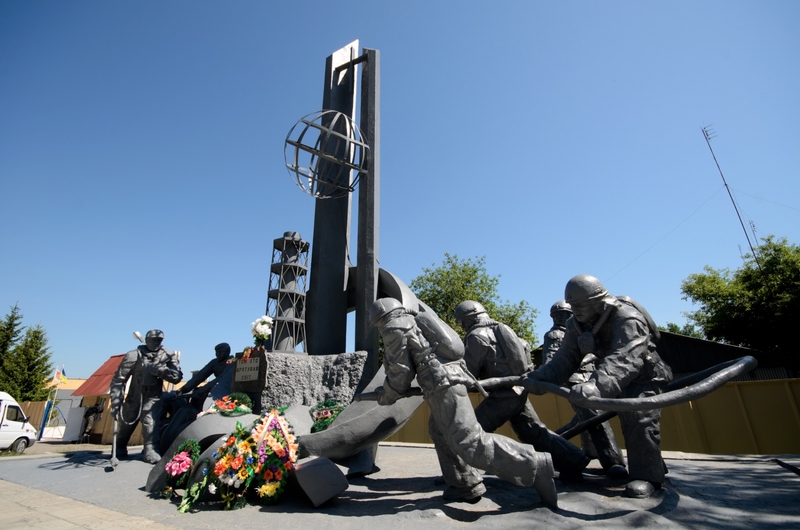 A little further down the road from the shop was the monument to the fireman who perished in the disaster, and as was the way with this trip, we drove the 100m down the road to get to it. 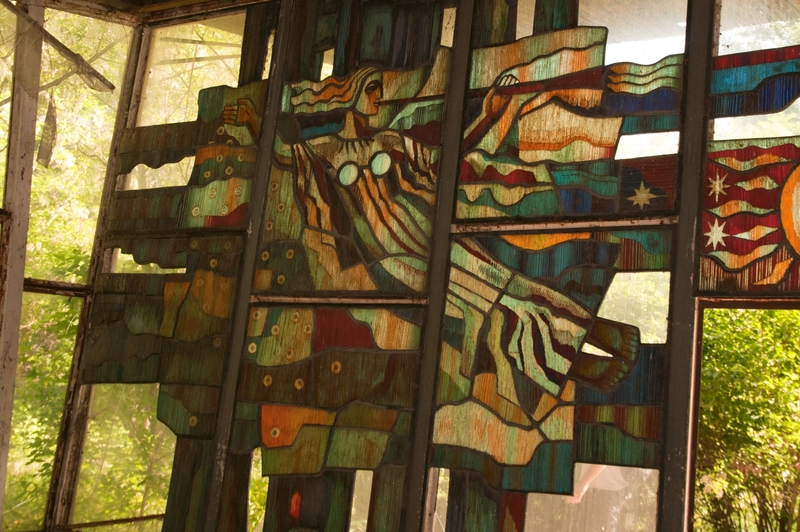 The Eastern Bloc countries know how to construct their memorials. 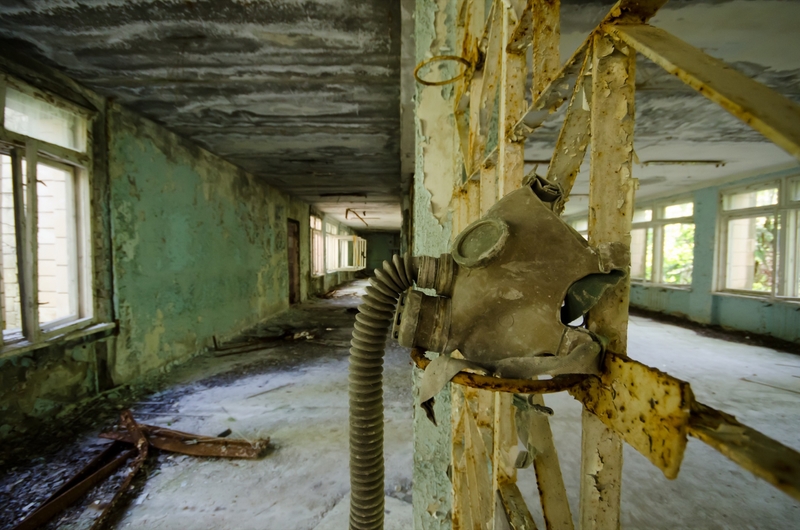 We didn’t immediately head towards the Reactors, or Pripyat. Instead, we drove off into the undergrowth and towards the partially completed cooling towers. 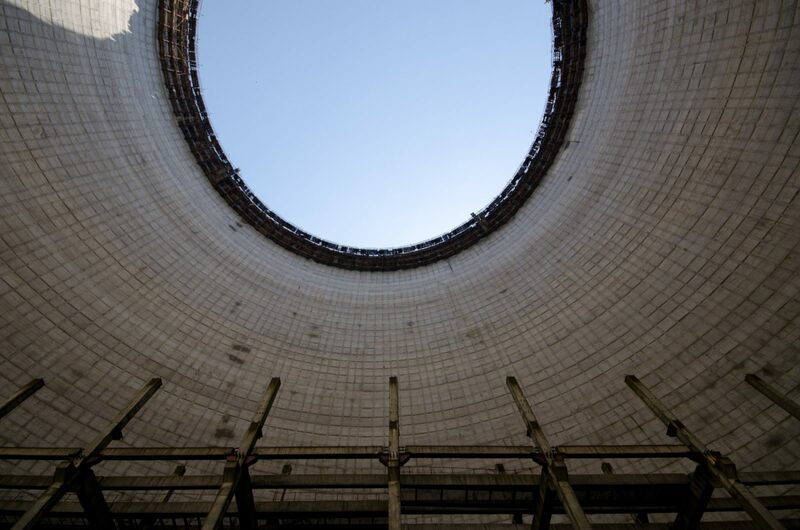 The first 4 reactors at Chernobyl use water cooling channels as their primary cooling medium, but the newer reactors were to have cooling towers. Reactors 5&6, and their cooling towers, were never completed due to the accident and lay in a state of semi-completeness. Scaffolding still clung to the rim of the cooling towers and the construction cranes hang dormant over the reactor buildings. Cooling towers have some fantastic acoustics and some unusually high radiation levels due to the dust accumulation inside. 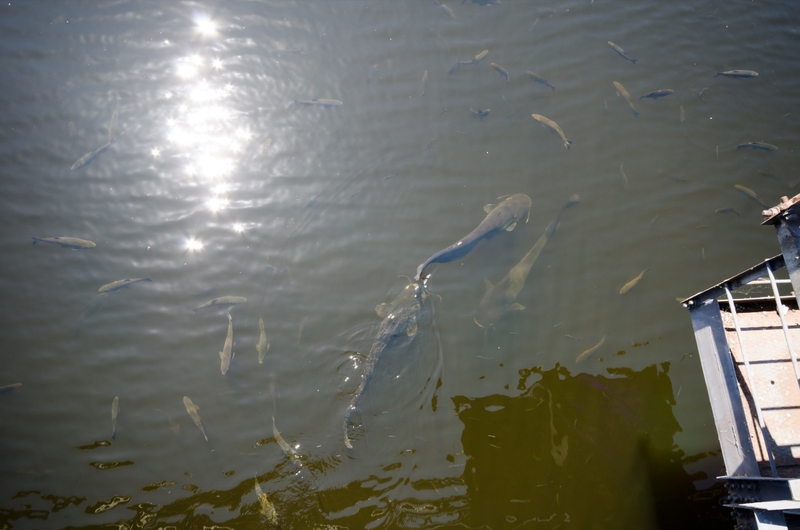 We didn’t stay long here and moved off in the direction of the Reactors and to enjoy a spot of fish feeding. You never realise how big a power station is until you stand up close and have it tower over you. 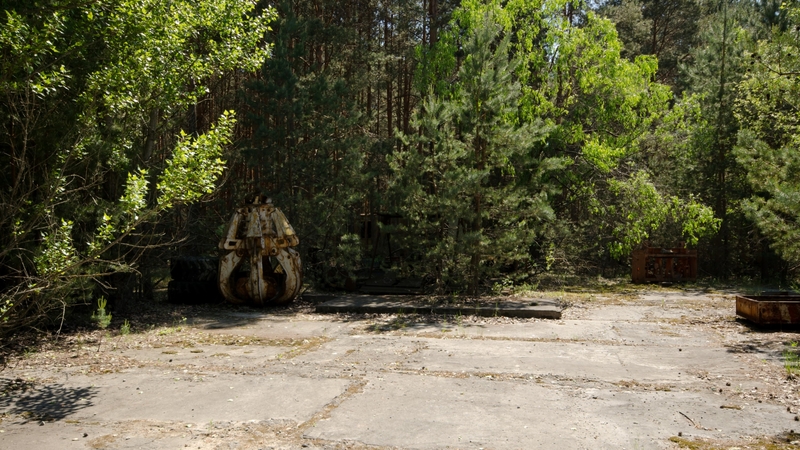 Reactor 4 blew up in 1986 and the Russians set about burying it below a mix of sand, boric acid and cement. There is only one problem, the Russians were never very good at concrete and the sarcophagus that shrouds the reactor is crumbling. To make matters worse, the ground slab that was built after the explosion was never sealed properly and rain water leaks through the structure and into the ground, picking up radiation as it goes. Since we visited, the EU has tented it under a specially constructed steel structure in an attempt to confine it if it collapses. Of course, we didn’t know this much detail when we left and happily wandered around the memorial site at the foot of the reactor. The group at this time was a buzz of excitement, we all stood about for posed photos and cracked jokes. 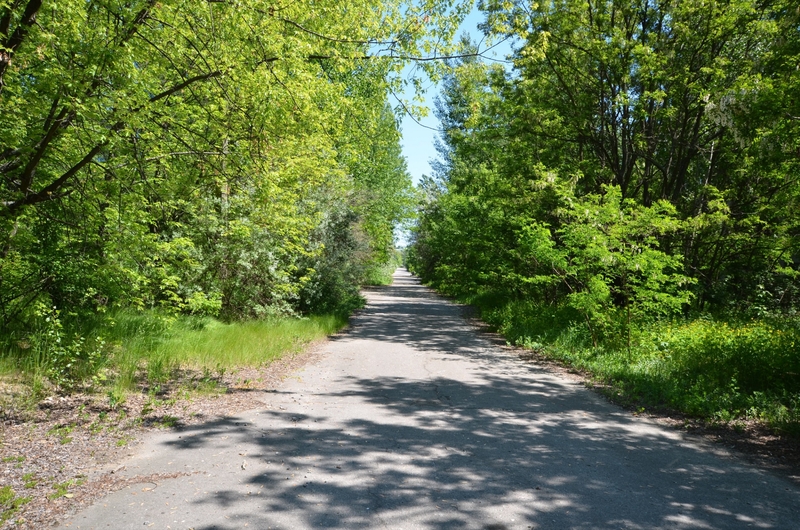 From here, we headed to Pripyat and had to pass through yet another checkpoint nestled between tumbledown barbed wire fences and lush green vegetation. 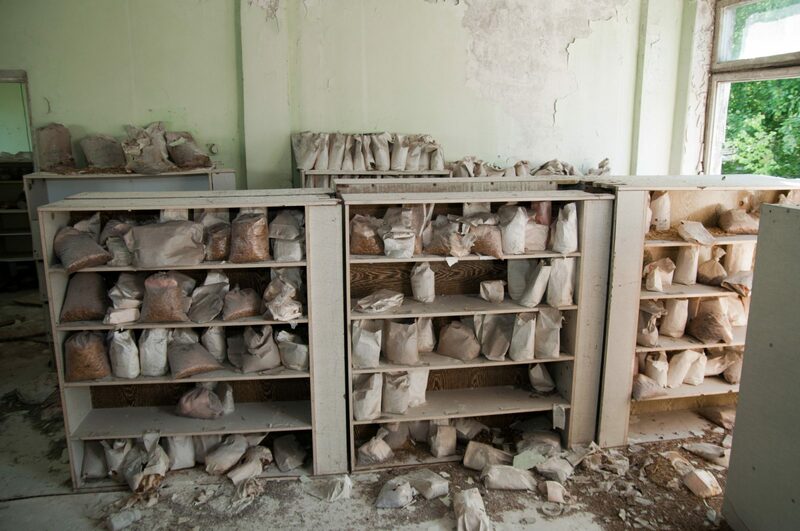 It is hard to described driving into an abandoned city as it is not something we do everyday. Phrases such as post-apocalyptic, worlds end, nature reclaims all, and desertion come to mind. And as much as it is a cliché, it was exactly that. Sometimes a cliche works and we found ourselves driving down a post-apocalyptic road that was originally a 4-lane high way that bisected the city (sorry, we had to say it). The minibus could barely squeeze past the undergrowth as we zig-zagged around many obstacles that potentially blocked our paths. It was impressive as well as slow going. Buildings would reveal themselves in a passing glimpse, only to then be swallowed up by a green mass; side roads resembled footpaths and lamp posts were easily mistaken for trees. 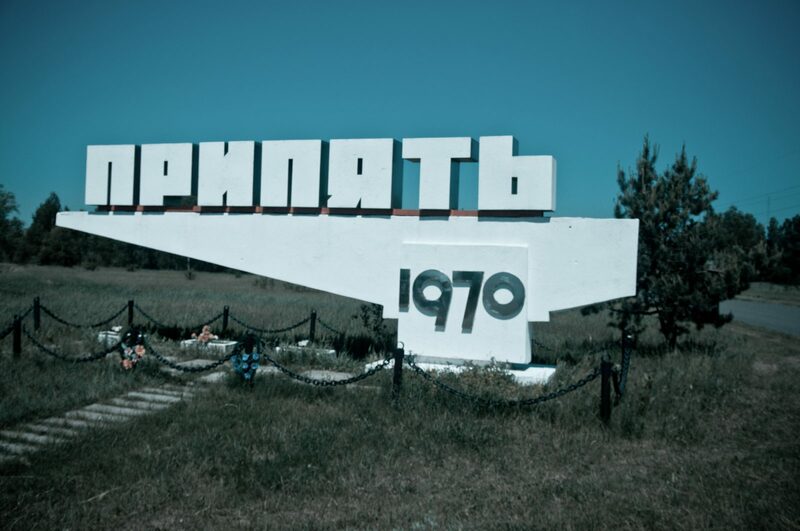 Pripyat wasn’t immediately abandoned, it took a few days for the Soviets to issue an evacuation order and parts of the city were still in use for workers of the power plants as late as 1998. 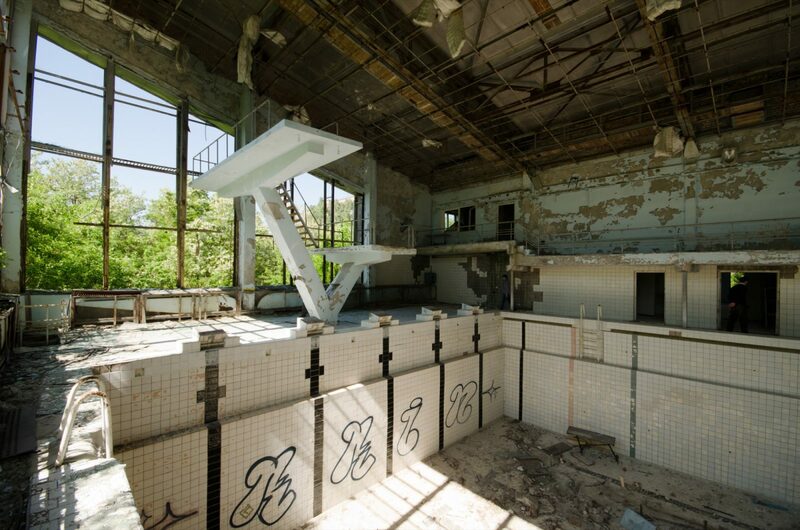 The swimming pool and sports hall was fully function up until 1996. After making our way slowly through the undergrowth, we ventured upon part of the city administration the fire, police and city workers buildings. 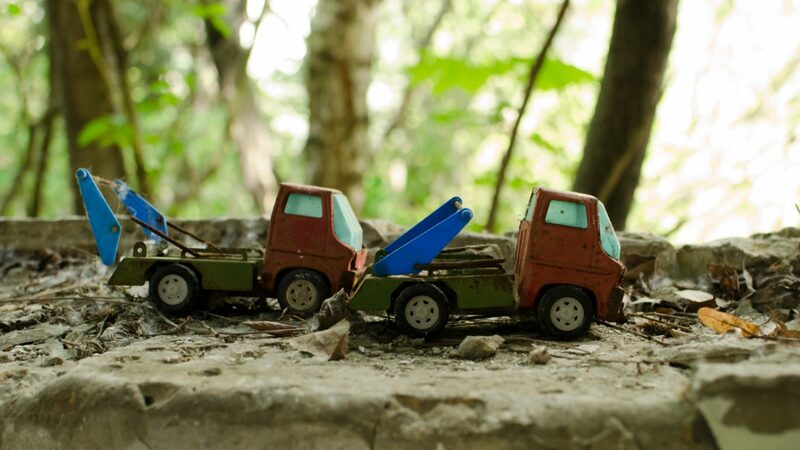 A small part of the group detached themselves and started crawling all over the derelict vehicles that were strewn around the yard. We found ourselves surrounded by enthusiasts, whilst overlooked by vehicles perched on roof tops! We joked that their current state was how they had left the factory. Our guide quickly ushered us back into the minibus in an attempt to stop us scattering like kittens. He had a point, the curious will wander. And wander we did. Whenever we have told someone that we spent three days touring ‘The Zone’ we get asked the question “weren’t you worried about radiation?” Not constantly, no. 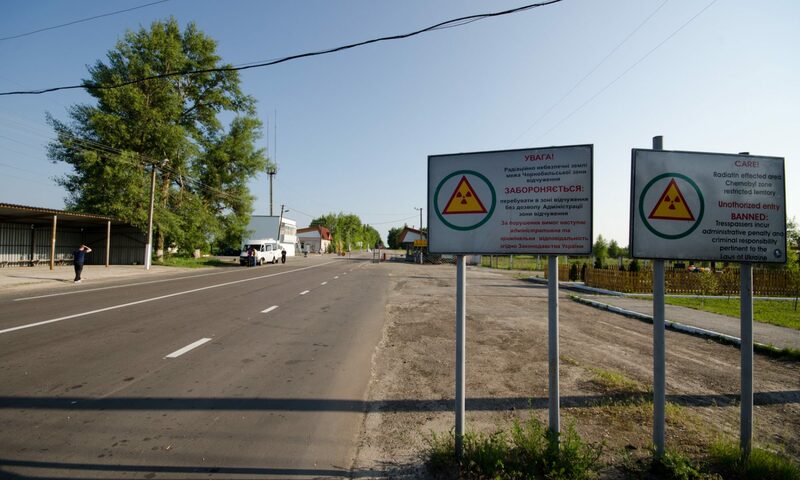 We had Geiger Counters and out own experiment showed that we received more radiation on the 4 hours flight into the Ukraine than we did during our 58 hours in the zone. Upon entering the zone we received strict instructions from the Chernobyl Inter-Inform Agency regarding dangers we faced, radiation was near the bottom of the list; the only caveat was that we did into venture into the undergrowth as the radiation levels are noticeably higher, as are the dangers of tics, bears and wolves. During our tour we did venture to see one of the mechanical grabbers that was used by the helicopters to lift radioactive debris back into the reactor hall; the radiation levels were incredibly high and we didn’t hang around for too long. It is here that we originally got to when we started writing the original post five years ago and the final line was “bugger this, this is long” and we left it abandoned – so here goes, lets finish attempt to this. One of the lasting memories from our trip was the time spent in the minibus with Armin van Bureen blasting along with us. Our driver had one specific taste in music and nothing could sway him – not everyone agreed with it – but with the sunshine beaming it eventually grew on use and seemed to fit our moods. We still now, 7 years on, have some of the mixes on our phones as it brings back some great memories. For anyone that has played the first Call of Duty Modern Warfare, our next stop was somewhere familiar. The swimming pool and fitness centre. A huge empty, tiled hole in the ground that inspired some great photographs. 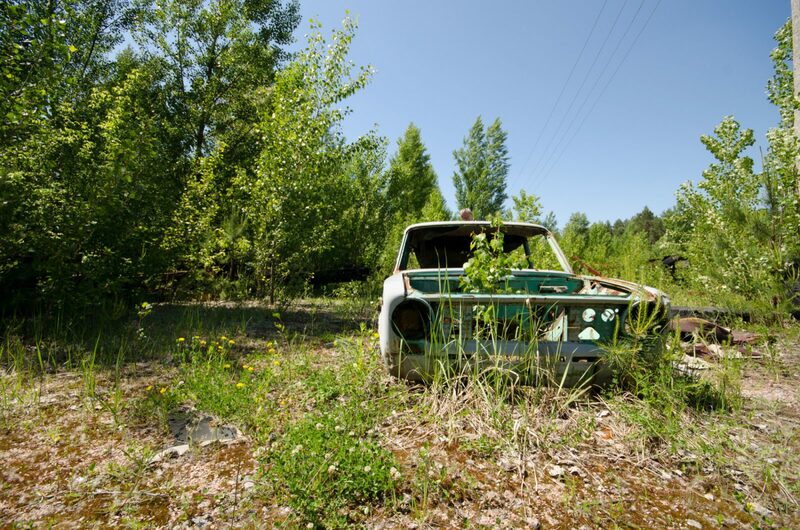 As we have described earlier, Pripyat is densely overgrown place. Across the street from the leisure centre was one of Pripyat’s middle schools (1 of 19), but we couldn’t see it until we were right on top of it. Typically we drove there! This was the first place that the abandonment really hit home. Everyone can remember what school was like. The noises. The strict teachers. The playground. 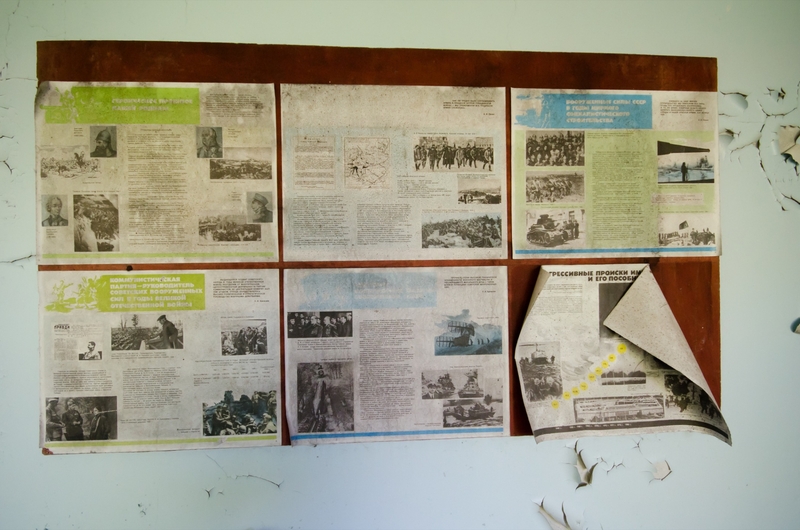 It was a huge sprawling complex, littered with old books, posters, furniture and gas masks. Everything an explorer wants; nothing had been removed and subsequently thrown about the place by looters and other visitors. 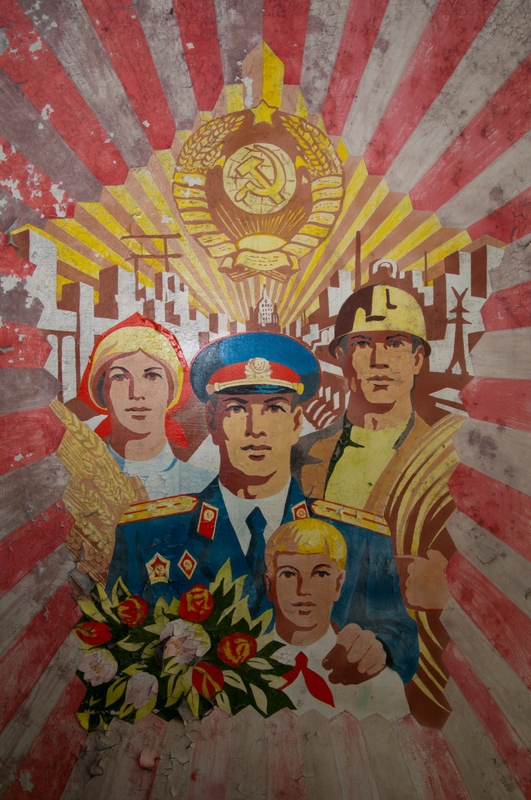 One of the numerous undertakings by the The Soviet Union was to stockpile gas masks in every public building, for fear of another attack on the Motherland. 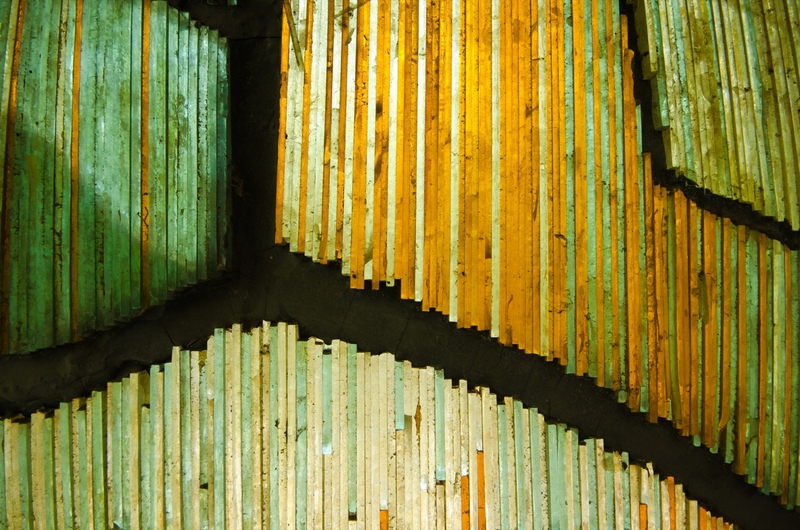 Only now they lay scattered through an old kitchen gathering dust after the metal poachers had removed anything of value. A striking realisation of the paranoia that gripped, and still grips, Russia. The only other time that we were acutely aware of the preparations of the Soviet Union were when we travelled the Metro in Kiev, where huge blast doors that would turn the station into a shelter were still evident. 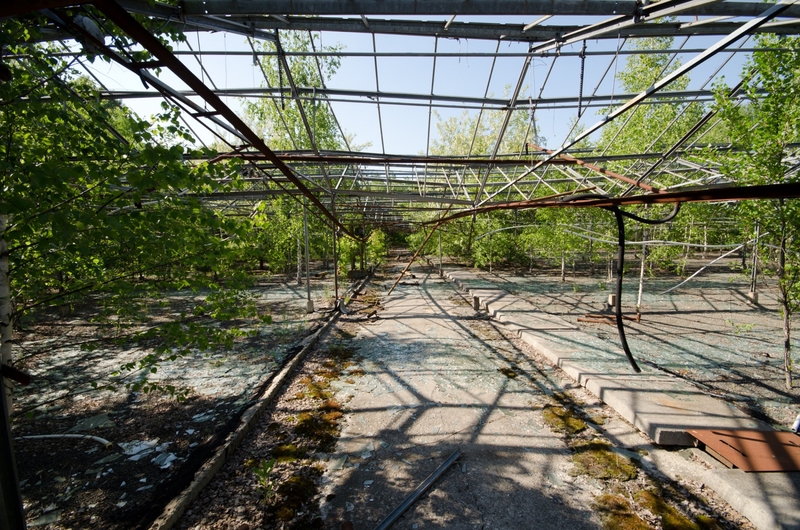 Our final stop for the day before a dinner of Ukranian sausages and pasta was to the Greenhouses; Pripyat was furnished with a huge set of greenhouses (now smashed) to provide the town with the needed provisions during the winter months. 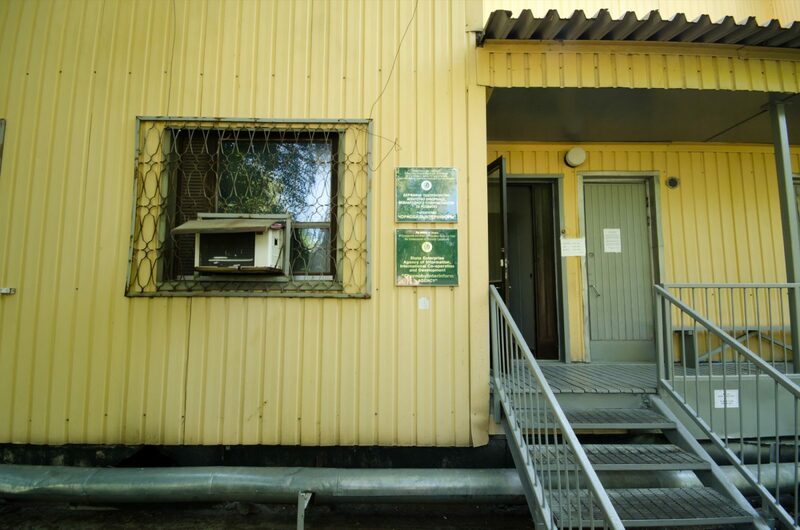 The small scale seed laboratory attached to the side was used after the accident as a soil sampling laboratory to track the spread of radiation throughout the exclusion zone. 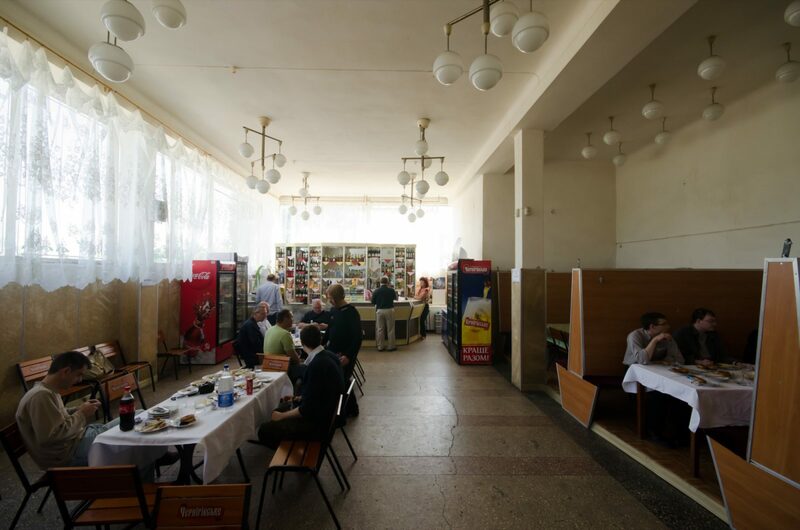 After a night of sitting about chatting a whole heap of breeze whilst drinking cheap Ukranian Beer we had picked up in another confused trip top a shop, we settled down for bed in a very warm workers barracks. Day two started in the same manner as our first day – an early rise, breakfast in the workers canteen (pancakes), a trip to the shop for supplies, Kvass and another round of confusing communication followed by a race to the next checkpoint with Armen Van Bureen jarring our eardrums. 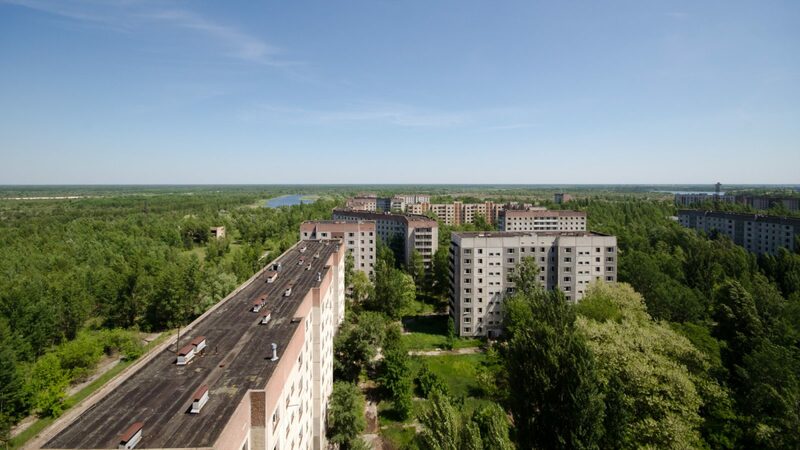 Having long held the belief that climbing to the highest point whilst exploring is the best way to understand the scale of somewhere, it was a perfect day to find ourselves 15 storeys up overlooking the abandoned city of Pripyat from a precarious balcony. Decaying buildings sprouted up from the forest canopy like a long forgotten Mayan city in the middle of jungle and the decaying hulk of the ruined power station loomed in the distance. It really did put into perspective the damage human actions can have! After enjoying the views, the discipline of the group descended into chaos; we had strictly been told not to climb out onto the roof as there was a temporary ban in place after someone injured themselves a few weeks earlier. This was quickly ignored and half the group disappeared up a small ladder and out into the roof in the morning sun. The other half stood on various balconies and decided to see who could frisbee plates the furthest. Our guide wasn’t overly impressed with our behaviour and hastily ushered us out of the flats after various items discovered the effects of gravity inside a lift shaft. Following our descent into what resembled a mob of teenagers, our next stop was a far more sombre affair and the bravado and rowdiness ceased. 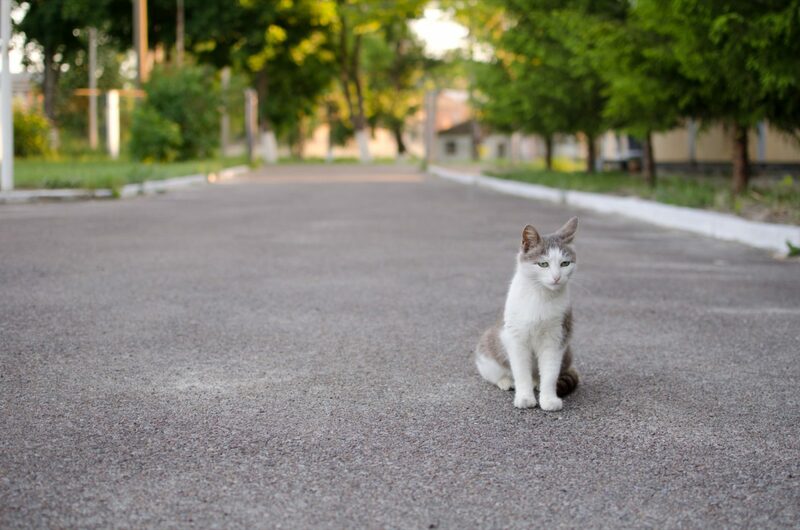 Pripyat had 75 kindergartens dotted throughout the city to serve the population of 50,000 residents and our next stop was the Kindergarten Cheburashka. It was as we climbed into the building did it dawn on us that the children who would have attended the Kindergarten at the time of the accident were no older than us! 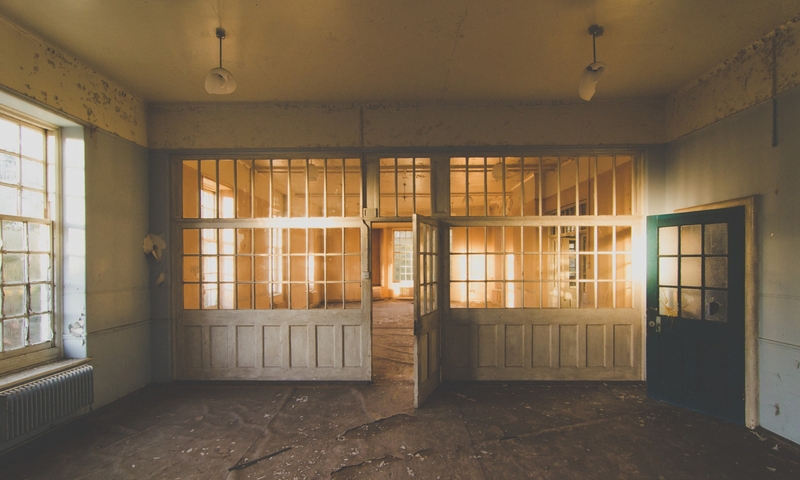 We silently moved through the building in a sombre mood as children’s toys, miniature abacus, clothing and cots scattered about the place left us in a contemplative mood. A small mount of Trance music picked up the mood was we travelled onto the next place! 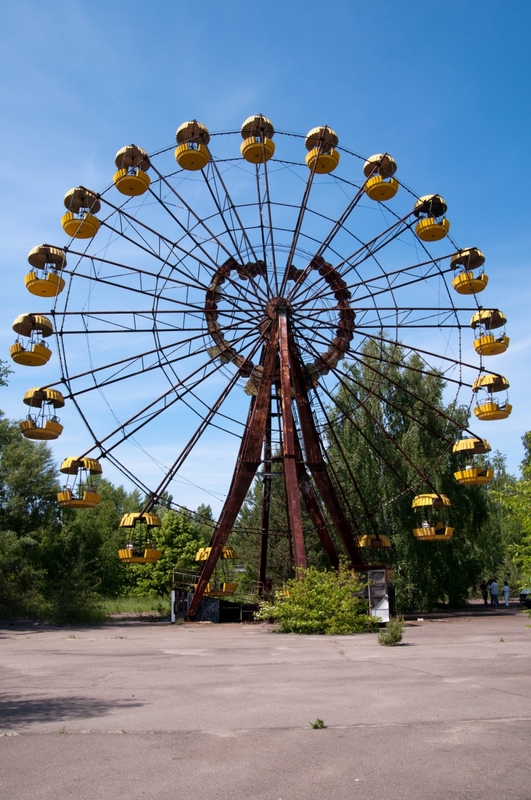 Over the years, Pripyat has become famous for one thing; the Ferris Wheel and Funfair. Our guide had given us a choice of where to go next and the group decided that for the benefit of the few who hadn’t seen it, we should pay the wheel a visit. We pulled into the square that was home to the funfair only to discover that a “photo shoot” was in progress and our guide ushered us off around the corner. The photoshoot was something to do with being “young and radioactive” and not a lot of clothes, ahem. We spent a short time wandering around the funfair as there isn’t actually a great deal to see once you have taken a wide angle shot of a bumper car etc etc. As is the way with touring the Exclusion Zone, we loaded ourselves into the minibus and drove the 50 metres to the Culture Palace. OK then. Not much to say from here other than we all disappeared into the woodwork and crawled over every single corner of the building. Unfortunately, we didn’t find a way down into the basement, where we had hoped to find a Soviet shelter. Our guide swerved our questions on what was down there and took us over to the riverside cafe instead. I don’t think our guide Maxim was quite prepared for this offer and quickly bundled us all into the minibus murmuring that we needed to leave now to make our exit time at the checkpoint. We had time, we should have taken the train. Nevermind, it was time for a few more beers!